Posted August 31st, 2017 | Category: How To, Netflix, Spotify, Stream & Save. Streaming media like music, movies, and shows online has been around for decades now, but has reached new levels of popularity with the introduction of popular (often paid) services. As cable-cutting becomes more intuitive and budget-friendly, traditional cable subscriptions are increasingly more complicated and pricey. It’s a no-brainer why entertainment enthusiasts are choosing options for streaming media online. A clear winner in many streamers’ eyes, Netflix is powerhouse in the online streaming industry. With so many titles available at any given time, you can stay entertained for hours (as long as you have internet and the titles you want are still there). 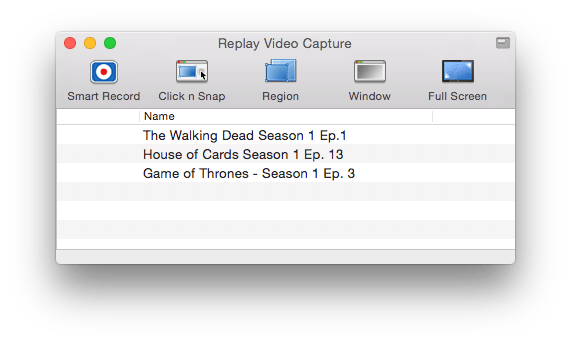 To record, download and capture movies and TV shows from Netflix, you can count on Replay Video Capture. To record from Netflix, just get Replay Video Capture, open Netflix and play the video you want to record, then click “Start Recording.” Replay Video Capture will automatically store your recorded content into a high quality format you can watch anywhere. Spotify is a force in the music streaming world. With 20 million songs from thousands of artists in every possible genre, there’s endless music to enjoy – as long as you have a WiFi connection. Lucky for you, listeners can download music from Spotify and save every track into individual, perfectly-tagged songs using Replay Music – this makes it simple to listen to all your favorite music, anywhere. All you have to do is open the program on your computer, start the music, and click “Record” to record any music from Spotify. Soundcloud gained its popularity in the MySpace era of the mid-2000’s with their simple platform for musicians to upload and share music. Naturally, this also attracted a lot of listeners, and today the streaming site boasts over 175 million monthly users. Replay Music is the most powerful way to record Soundcloud music directly to high quality MP3 files. Advanced recording technology captures only the music you want to hear, and never any system sounds or background noises. YouTube is home to sensation after sensation, music videos, full video series and even exclusive live streaming events. The entertainment doesn’t have to end when your WiFi fails you or your favorite channel removes some of its best content — Replay Media Catcher lets you download videos from YouTube so you can watch again and again. With downloads that run 10 times faster than playback speed and lightning-fast conversions, Replay Media Catcher makes it easy to download from YouTube and automatically convert these videos to MP3, WMV, AVI and more. Plus, with a live stream monitor feature, you can actively track and record any YouTube live event. Have any questions about how to save online media from these awesome streaming websites? Contact our Support Team at any time. Posted May 2nd, 2017 | Category: Netflix, Replay Video Capture, Stream & Save. Another new month, another chance to enjoy some great new titles on Netflix! Arguably their best and worst quality is the constantly rotating collection of TV shows, movies, and documentaries available; while there’s always something new to watch, you just have to make sure to download from Netflix before your favorites go away. Get ready for a heap of awesome content coming soon — from Netflix original movies to series specials to mainstream films, there’s a little bit of everything for online streamers. 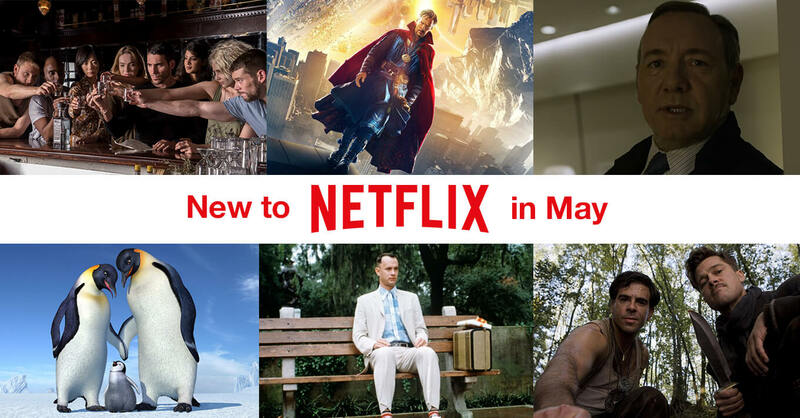 Here’s our pick of some titles coming to Netflix starting May 1st. An animated musical with some of Hollywood’s top stars voicing adorable penguins sounds like just about the most wonderful family movie ever. Happy Feet follows the story of Mumble (Elijah Wood), a young emperor penguin who has a terrible voice but can’t keep from tap-dancing around Antarctica and making a ton of friends along the way. You can watch and download Happy Feet on Netflix, available 5/1. A forever kind of classic, Forrest Gump is one film you won’t want to miss capturing for your collection. With Tom Hanks in one of his most infamous roles and a young Robin Wright as his illusive co-star, you’ll find yourself within one man’s journey from disadvantaged and disabled to inspirational and completely unrestricted. You can watch and download Forrest Gump on Netflix, available 5/1. What would happen if you woke up one day and were suddenly linked, intuitively, to other people around the world? What if you could travel to them in the blink of an eye? Sense8 is an action-packed Netflix original series from The Wachowski sisters (of the Matrix franchise fame) that follows 8 strangers as they navigate the confusing, complicated and often dangerous world they now live in. You can watch and download Sense8: Season 2 on Netflix, available 5/5. America’s snarky sweetheart is back for another season of her talk-meets-adventure show, Chelsea. The hour-long series will feature some amazing in-depth interviews and, of course, her signature envy-inducing dinner parties, airing once weekly, along with a lot of travel and self-exploration. You can watch and download Chelsea: Season 2 on Netflix, available starting 5/5. Aziz Ansari drew inspiration from his own personal life experiences to create the characters and situations in Master of None, a wonderfully enjoyable Netflix original comedy. Playing Dev, a struggling actor living in New York, Ansari explores life in the modern era with all of its twists, turns, and weird expectations. You can watch and download Master of None: Season 2 on Netflix, available 5/12. Inglorious Basterds tells the fictional alternate tale of a secret assembly of soldiers on a mission to eliminate the Nazi Germans in WWII. Starring Brad Bitt, Christoph Waltz, Melanie Laurent, and others, it’s a brutal, yet hilarious, account of a plot to assassinate Nazi leaders and navigate the tense era. You can watch and download Inglorious Basterds on Netflix, available 5/22. Conquering Washington, D.C. with skill and ruthlessness is more complicated than the President and First Lady anticipated. Season 5 of our favorite political drama, House of Cards, is set to begin soon, offering with it all of the cold-blooded and calculated political moves we’ve now come to expect. You can watch and download House of Cards: Season 5 on Netflix, available 5/30. One of Marvel’s more recent blockbuster hits is coming to Netflix earlier than we’d expect. Starring Benedict Cumberbatch as the doctor himself, Doctor Strange follows a neurosurgeon as he attempts to recover from an accident of his own. When traditional medicine fails him, he makes science work for him; but of course, it’s not all good news. You can watch and download Doctor Strange on Netflix, available 5/30. Get Replay Video Capture to download and save all of your favorite Netflix movies and shows! Posted March 20th, 2017 | Category: Netflix, Replay Media Catcher, Stream & Save. What do you do when you want to enjoy your favorite Netflix shows, but lack access to WiFi? If you’re doing things the right way, you’ll have them downloaded and at-the-ready, anytime and on any device. With its many shortcomings, you can (and should) arm yourself with special tools to help you dive through any obstacles that an Internet connection or Netflix account may throw at you. Replay Media Catcher is a powerful program built to download movies from Netflix and other online streaming websites, so you can watch your favorites at any time. 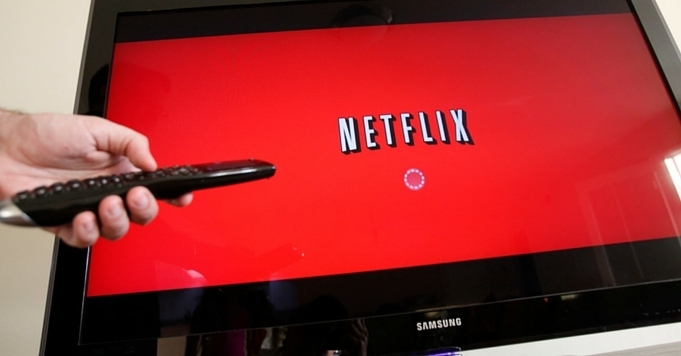 Netflix isn’t perfect, and your viewing location often isn’t either. With the streaming services’ constantly rotating catalog paired with the unreliability of the Internet, WiFi-less traveling and more, it’s more important than ever to keep your favorites offline. If you don’t know how to download movies and shows from Netflix, you might not be able to see your favorite content if it’s taken down, or when you’re in an area with spotty (or no) Internet connection. When in doubt, it’s always safer to download from Netflix first before enjoying later! Replay Media Catcher is the ultimate downloader for Netflix. With advanced technology that downloads at 10x playback speed, seamless integrations with iTunes, Google Drive and more, and a built-in converter that supports all major file types, it’s the best way to capture and save all your favorites to view offline. 1. 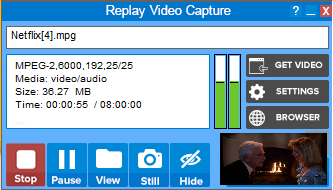 Get Replay Media Catcher for PC from the website. 3. Open Replay Media Catcher and click to start the Digital Video Recorder. 5. Navigate over to the Netflix movie(s) or TV show episode(s) you want to record. You can either drag and drop the URLs into Replay Media Catcher OR download it as you watch. 6. Once downloaded, you’ll notice the file status change to “Complete.” Now you’re ready to save your downloaded Netflix content anywhere! Even More Perks of Replay Media Catcher! Use built-in Media Guides to locate movies and TV shows from Netflix without entering the site. Export downloaded Netflix content to iTunes or Windows Media or keep as a simple MP4 video. Save movies and shows on ANY connected device to watch at your convenience, including tablets and smartphones. Turn on Auto Mode to keep Replay Media Catcher on the lookout for any video or online content to download automatically. What are you waiting for? Click below to get the software for yourself! Posted February 3rd, 2017 | Category: Netflix, Replay Video Capture. Wonky WiFi, catalog rotations and lack of Internet on-the-go are problems all too real for Netflix lovers. And, while Netflix may let you save some content offline, the choices are limited to very select titles and don’t allow you to watch or save on the devices you want. Replay Video Capture makes it simple to take your favorite videos from Netflix and enjoy them all anywhere. Easily download Netflix movies and shows, and then save the videos back to your computer in a high-quality format. 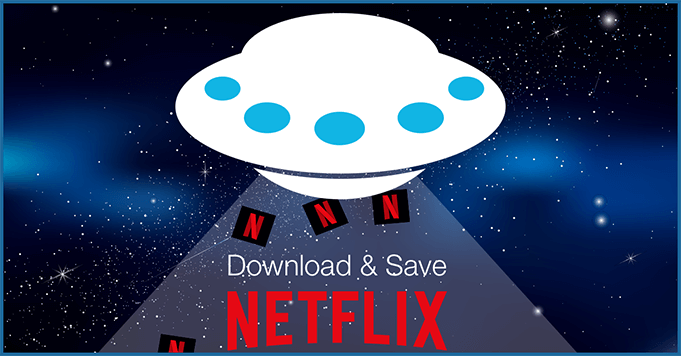 With the files from your recorded videos saved on your computer, you can easily save on all of your devices to watch Netflix offline anywhere! Schedule Netflix recordings, boost audio volume, and even stream and record in background mode* — it’s the best way to make lightning-fast, production quality video recordings of all of your favorite movies and series, so you can download Netflix and watch anywhere. 1. 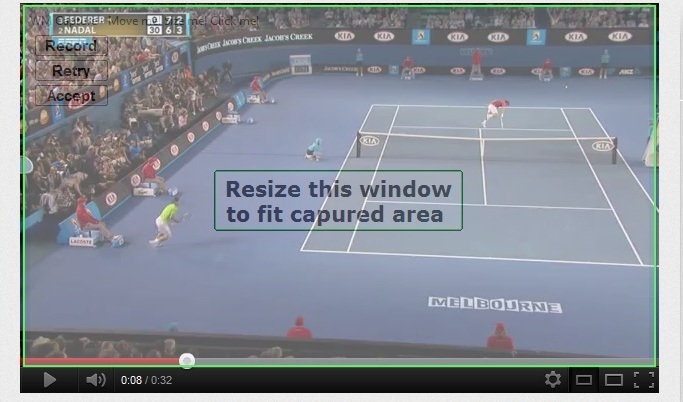 Download Replay Video Capture and open the software. 2. Launch your browser and start playing the video on Netflix you want to save. 3. Click Get Video — the software will automatically find and mark the video on your screen. 4. Record! Replay Video Capture will start saving your Netflix favorites to watch offline. No more boring flights, stale road trips or mind-numbing commutes! After using Replay Video Capture to save Netflix movies and TV shows, you’ll never have to worry about being offline or without WiFi again. You can download Netflix and save the content as MP4, WMV, DVDs, and just about every other popular video format. And, unlike other screen video capture programs, Replay Video Capture is designed for the highest quality video output, recording at up to 100 frames per second. Learn more about how to record and download Netflix movies in our Replay Video Capture User Guide. On a Mac? Follow the instructions on this page to download from Netflix. Please reach out to our team with any questions, comments or concerns – we’re here for you! *With background mode, you can run other programs while Replay Video Capture is recording, without any risk of obscuring the recording area. Posted October 27th, 2016 | Category: Netflix, Replay Video Capture, Stream & Save. Movie buffs and Halloween enthusiasts alike are also thrilled to see the growing list of film favorites available to stream and record from Netflix. Whether you’re looking for the best Halloween movies to watch in droves this season, or even just some awesome Netflix hacks to make your binging out way better, we’ve got you covered. Like super scary movies? Goofy ones? Classics? Thrillers? 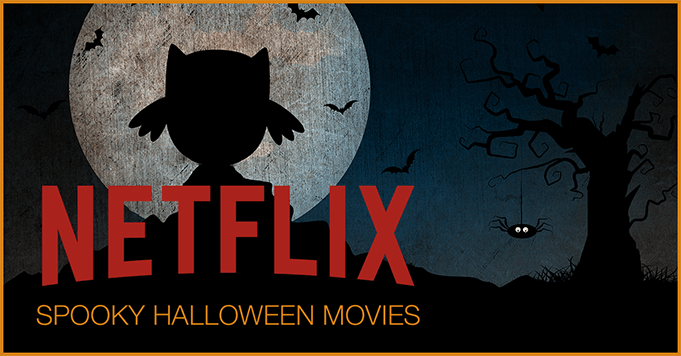 We gathered up a genre-packed list of some of the best Halloween movies on Netflix you can stream online. 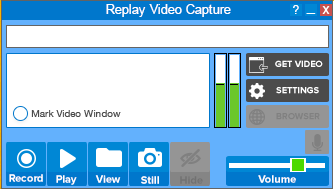 Remember — you can use Replay Video Capture* to record them all! * Mac users must use Firefox to stream and save. Sandra Bullock and Nicole Kidman star as two close sisters who get into a little trouble with the law, along with some other spooky, yet comical, situations — oh, and their whole family is full of magical witches. A widowed mother, a fearful son, a creepy illustrated book… it’s already the perfect setup for a horror movie. This independent film boasts a gripping storyline and seriously scary effects that’ll have you wanting a night light. Everyone’s favorite childhood book series is finally a movie. With Jack Black playing host in this slightly-spooky-mostly-funny version of R.L. Stine’s literary masterpieces, the nostalgia and Halloween feels will overwhelm you. Old, dramatic cult movies are sometimes the absolute best for Halloween. What happens when you cross a poorly tested teleportation machine with a fly and a human? Well, we’re not going to tell you if you haven’t seen it. Guillermo del Toro directs this beautifully animated, super obscure film you need to see. The movie follows 5 classic, genuinely scary Edgar Allen Poe stories narrated by horror icons like Bella Lugosi and Christopher Lee. Addams Family Values is a perennial Halloween treasure – they’re everyone’s favorite smacabre family. It’s supernatural, it’s dark, it’s hilarious, and we can’t wait to watch it again and again, even after the spooky season ends. Have you ever called a vampire movie stylish or sleek before? Kate Beckinsale stars as a vampire warrior, caught in a war with the werewolf race. We love this film for its visually striking detail and action sequences. It’s a musical and a slasher flick all rolled up into one expertly-cast and directed film. Starring Johnny Depp, Helena Bonham Carter and other stars, and directed by Tim Burton, it’s a bloody, addictive Halloween favorite. Check out our step-by-step guide for how to download anything on Netflix with Replay Video Capture and be able to watch your favorite streaming media anytime, anywhere! Posted August 29th, 2016 | Category: Netflix, Replay Media Catcher, Stream & Save. Out with the old and in with the new! Every month, Netflix shuffles in new content (and gets rid of old favorites) as part of their constantly rotating catalog of media. Lucky for entertainment streamers everywhere, Replay Media Catcher for PC exists so you can watch and download from Netflix before your favorites disappear. 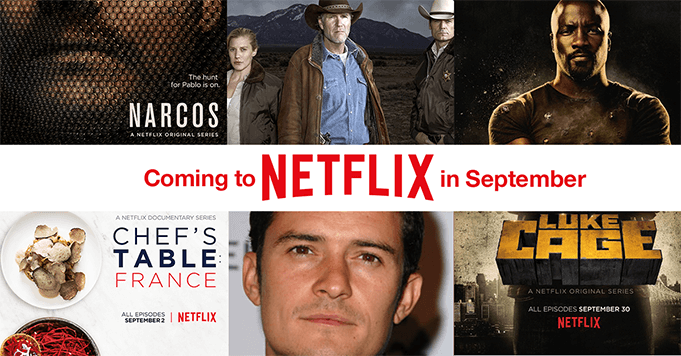 In the meantime, here are some of the top titles coming to Netflix this month (September 2016). Be sure to save them while you still can! Pablo Escobar is on the run in Season 2 of Netflix’s original series, Narcos. The breakout, kingpin-style cartel drama will conclude the infamous drug lord’s story in the upcoming second season – the final month of his escape. You can catch the next 10 episodes starting September 2, 2016. Download every intense moment with Replay Media Catcher. Like westerns? You’ll love Longmire. Following the life of an old-school sheriff who recently lost his wife, and based on the Walt Longmire Mysteries series of mystery novels, this A&E series is full of drama, crime and justice. Starring Robert Taylor and Katee Sackhoff, this is a series you definitely won’t want to miss saving with Replay Media Catcher. Based on the Marvel Comics character and set in the same universe, Luke Cage is a dark crime show about a former convict with crazy, super-human strength and unbreakable skin who now fights crime round the clock. If you like superheroes and fighting for justice, definitely keep an eye out for this show at the end of September. Foodies around the world are about to get another dose of delicious, mouth-watering television. Chefs get the chance to share their own story in Chef’s Table, a Netflix original series. Get a look behind what motivates, inspires and challenges incredible chefs in France with the upcoming season, and download every episode with Replay Media Catcher. The first season of Easy premieres near the end of the month, starring Orlando Bloom, Malin Akerman, Marc Maron and Dave Franco (just to name a few). While there aren’t a lot of details on plot points, its eclectic cast of amazing talent means this comedy is sure to be a smash hit. Or at least worth checking out. Posted July 18th, 2016 | Category: Netflix, Stream & Save. Summer is the perfect time to get outside, learn something new or binge on your favorite summer movies. Plus, with all the great new additions to Netflix this month, there are a TON of high-profile and classic choices for entertainment. Celebrate summer with some essential warm weather films! 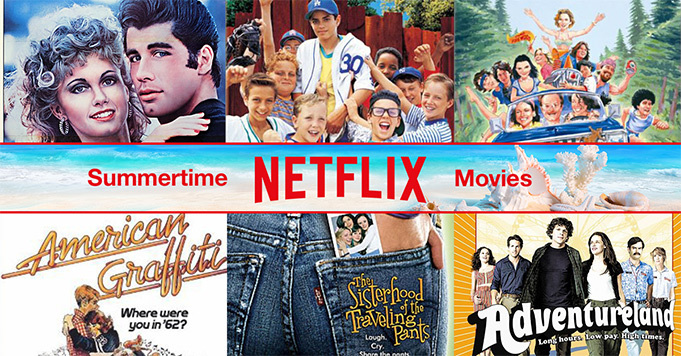 We’ve gone through what’s available and picked out our favorite, most summery summertime movies for you to record from Netflix with Replay Video Capture and enjoy sipping on a chilled drink outside. Whether you’re into summer nights, summer lovin’ or just some summer fun, Grease is an award-winning movie/musical hybrid that everyone loves. With (a very young) John Travolta in the cast of amazing and talented characters, you’ll want to record from Netflix and make it a tradition to watch every summer. If you were cool in the 1990’s, you probably know everything about The Sandlot. This quintessential friendship-meets-baseball-meets-debauchery movie has touched hearts and cracked smiles for years. Before this one gets away, take a second to enjoy and record. Wet Hot American Summer is a completely bonkers summer camp movie starring a hefty group of big-name comedy geniuses; Paul Rudd, Amy Poehler, Bradley Cooper and more. While it will always be hilarious, it won’t always be around – be sure to download from Netflix before it disappears. George Lucas’ classic film, American Graffiti, stars the likes of Ron Howard, Richard Dreyfuss and Harrison Ford. Following one day of teenage adventure in the “rock-and-roll culture” era, it was even deemed “culturally, historically, or aesthetically significant” enough for federal preservation in the National Film Registry. Nothing says summer like adventures around the world and spending quality time with your best friends. The Sisterhood of the Traveling Pants is a warm and uplifting, yet sometimes dramatic, journey of friendship (and pants). No matter your age or state-of-mind, this is a feel-good movie you’ll want to record before it leaves Netflix. Starring the king of awkward himself (Jesse Eisenberg), this flick is the ultimate ode to any summer job you ever got stuck with in high school/college. Adventureland is a friendly, coming-of-age type of comedy that certainly won’t last on Netflix forever. Download Replay Video Capture to record and save all of the most essential summer movies from Netflix before they’re gone!